Keto eating is becoming more and more popular. It attracts both ordinary people and celebrities. Keto diet shows good results in losing weight that is why the number of people who want to get in shape using Keto meal plan is constantly growing. 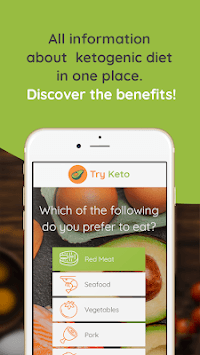 Try Keto App aims at making keto lifestyle easier for beginners. Download the app for free and find everything you need for Keto living. In brief, Keto is a low carbohydrate diet high in fats and moderate in proteins. Initially, it was used to treat children with epilepsy, and now it is often prescribed for people with 2nd type of diabetics. Such a diet makes the body to use fats instead of carbohydrates as the main source of energy. If you are one of those who have decided to try keto diet plan but have no idea how to start, this app will become your guide to keto eating. First of all, here you will find the best companies that deliver keto meals right to your house. All you need to do is to choose meals and wait till they are delivered right to your door. This is extremely convenient and time-saving. Enjoy delicious meals without the necessity to buy right keto products and cook them. All will be done for you by professionals. Also, here you’ll find lots of useful information on the main principles of the ketogenic diet, simple and delicious recipes and advice on keto weight loss. 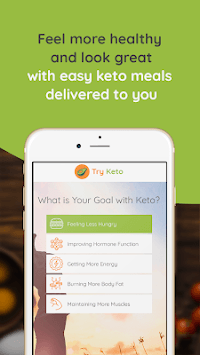 No matter what reasons for trying keto you might have, the app “Try Keto - Best Keto Meals and Diets” will be your wise advisor and ease the process for you. Notice: In no way you should treat the information given in the app as medical advice. We strongly recommend consulting with your doctor before you try this diet plan.